As the holidays approach, more and more drivers will be on the road to visit loved ones, take time off, and be cheerful. This increase in holiday spirit will also see an increase in law enforcement measures to help keep the roads safe. 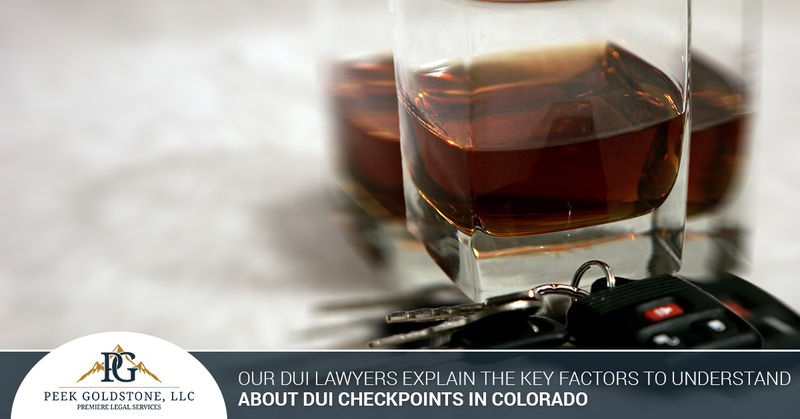 One topic that often comes up in Colorado for motorists is DUI checkpoints. This roadside stop can become inconvenient for many drivers, and may end up leaving intoxicated individuals with legal charges. As your trusted team of DUI lawyers in Greeley, Peek Goldstone is here to deliver complete guidance and representation for clients across the Front Range. Our attorneys rely on years of experience and collaboration to provide a complete approach for clients facing traffic offenses, DUIs, criminal charges, adoptions and divorces, tax defense services, mediation, estate planning, and more. In order for a sobriety checkpoint to be approved by local jurisdiction, it will need to adhere to strict locations and times. Clear plans must be in place for when and where to set up before any action can be taken. Drivers in Weld County should not expect any changes to approved plans. Unless a special situation dictates, every detail is set in stone. In order to limit discrimination, law enforcement officers are required to document and enact a chosen strategy for stopping cars to interact with drivers. Stopping every car, every other car, or ever six cars is fine, but the system must be used at all times to eliminate any grounds for discrimination. This system is open to change in the event it is needed, as long as officers deploy another approved system and document the details of their choice. Any evidence that shows that the rules were not followed can result in a checkpoint becoming declared illegal. Costly – Opening a checkpoint for a few hours can cost thousands of dollars. Between the labor costs, materials, and danger risks, many people wonder how effective one checkpoint can be, as the cost can total more than $10,000! Inconvenient – Rerouting traffic to any degree in Northern Colorado is a major challenge, with more people on the roads than ever before. Stopping motorists on Hwy 34, for example, could cause major disruptions for everyone in the community. Ineffective – Modern technology has helped to make global communication more streamlined than ever before, allowing the community to discuss any current our upcoming checkpoints. Ultimately, there are many ways in which citizens who wish to break the law can gain warning and plan their route accordingly during the holiday season. Critics cite that law-abiding citizens will likely never look for DUI checkpoints, resulting in high volumes of sober drivers stuck in traffic while those hoping to imbibe can take the scenic route. Regardless of the situation surrounding your arrest, it’s essential to reach out to a professional DUI lawyer for assistance. If you or a loved one are looking for assistance, be sure to reach out to our form today. It is imperative for officers to abide by all regulations when conducting a DUI checkpoint. Failure to follow proper protocol can lead to unfair outcomes for some citizens, creating room to fight DUI charges if you or a loved one were stopped at an illegal checkpoint. Having these charges overturned can provide considerable relief for many drivers. Regardless of the legality of your stop, it is advised to seek out a professional DUI lawyer for assistance! Peek Goldstone is here to help Colorado motorists keep safe in all forms, and our law firm is dedicated to providing ideal support for all of our clients. If you’ve been charged with a crime and are looking for a dedicated team of DUI lawyers in Greeley, we’d be happy to review your case with you (provided you have not obtained legal services yet). Our office is open from 8:00 a.m. to 5:00 p.m. Monday through Friday. Contact us today to learn more about our local team’s caring approach to DUI law.